The non-smoking Country Inn & Suites by Carlson-Orangeburg SC features a complimentary full breakfast indoor pool hot tub and on-site fitness center. This hotel has 81 rooms on four floors. Each room includes free Wi-Fi a microwave refrigerator and coffeemaker in addition to cable TV with premium channels. 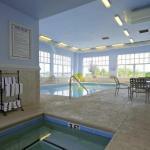 Guests can have a relaxing swim in the heated indoor pool relax in the hot tub and work out in the fitness center. The hotel offers laundry facilities and a 24-hour business center. Parking is complimentary. The Country Inn & Suites is located six miles from South Carolina State University and the I.P. Stanback Planetarium. Hillcrest Golf Course is three miles away. Orangeburg Municipal Airport is eight miles from the hotel.